The opportunity for treatment center leaders to talk openly with one another about how they’re dealing with different challenges is priceless. Many of the biggest “aha moments” occurred during the Summits’ less-structured brainstorming and sharing sessions. Armed with data showing how their center is performing versus norms, attendees can develop a very detailed performance improvement action plan during the two-day Summit. In order to have a fully fleshed out plan, it is helpful to have 2 to 3 attendees from a center attend so that leadership, clinical, quality assurance and operations are all represented. 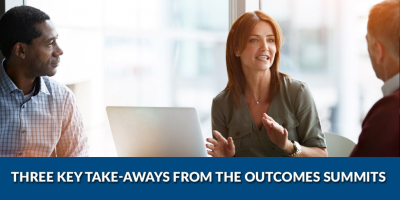 You can learn more about the 2019 Outcomes Summits here. And if you're interested in having Vista conduct a strategic planning event specifically for your staff, don't hesitate to call us at (800) 215-3201!